Yuhi Sekiguchi (Itochu Enex Team Impul) wins the sixth round of the 2017 Japanese Super Formula Championship at Sportsland Sugo. For the driver of the #19 Toyota it’s the second win of the season and his fourth Super Formula win in a career. Pierre Gasly (Team Mugen) and Kazuki Nakajima (Vantelin Team Tom’s) completed a podium after the 68-lap race in which Nick Cassidy (Kondo Racing) started from pole. The young New Zealander had a bad start, he almost stalled on the grid, so a fellow front-row starter Sekiguchi took the lead. Cassidy dropped to fifth and eventually finished last. Pierre Gasly jumped to P2 at the start and stayed in that position until the end, not managing to pass Sekiguchi. 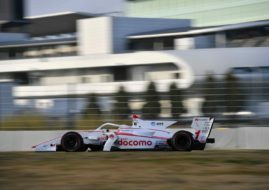 Second place brings him a plenty of points and he is now second in the championship, just half a point behind Hiroaki Ishiura, who finished sixth today. Two more final races of the season are scheduled for October 21-22 at Suzuka Circuit.